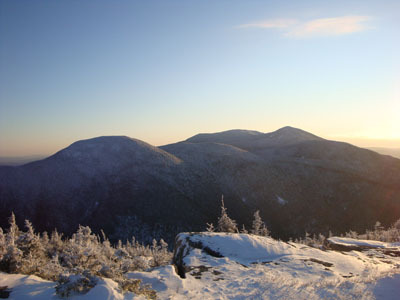 Kinsman Mountain is located south of Cannon Mountain, separated by a series of peaks known as the Cannonballs. 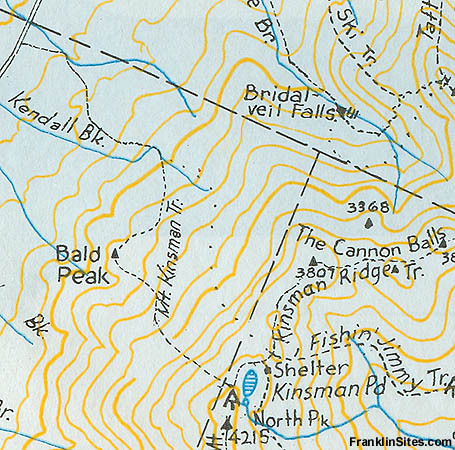 In the 1930s and 40s, an alpine ski trail descended from northern shoulder of North Kinsman (the southern end of the Cannonballs) to Route 116, with a cabin located near the midpoint of the trail. 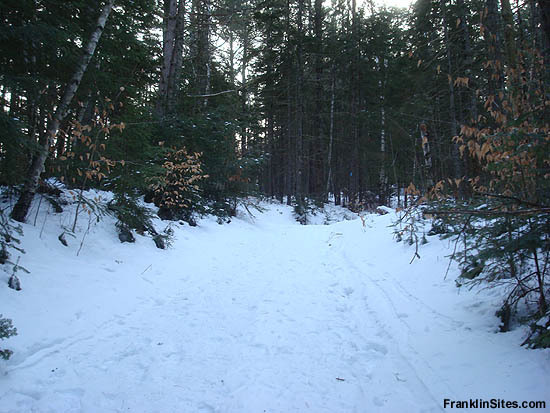 While the cabin and upper portion of the ski trail are long gone, portions of the lower end (mainly a hiking trail) are still skied. 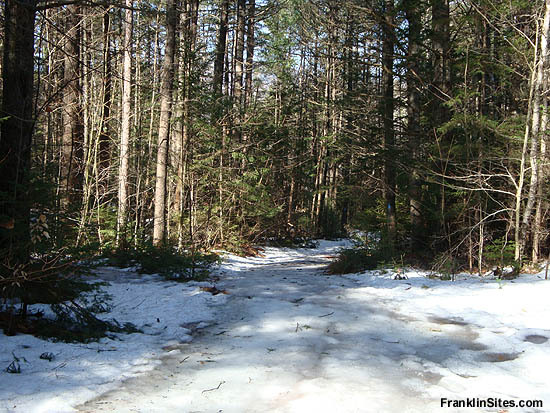 The Kinsman Ski Trail was opened in the 1930s, consisting of a net new upper portion of trail and a widened lower portion of an existing hiking trail (the Mt. Kinsman Trail). 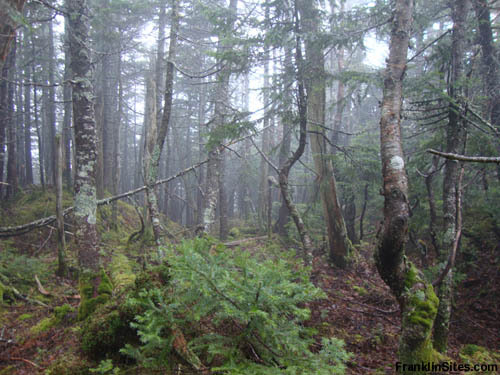 Top of the trail, located north of North Kinsman Mountain, was nearly 3,800 feet in elevation. A cabin was built near the mid point of the trail around 1937 (removed in the 1980s). 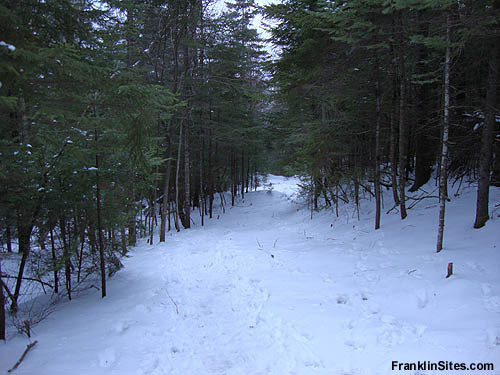 While the upper portion of the ski trail was likely abandoned in the 1940s or 1950s, the gradual lower half of the trail remains open as a hiking trail and is still skied. 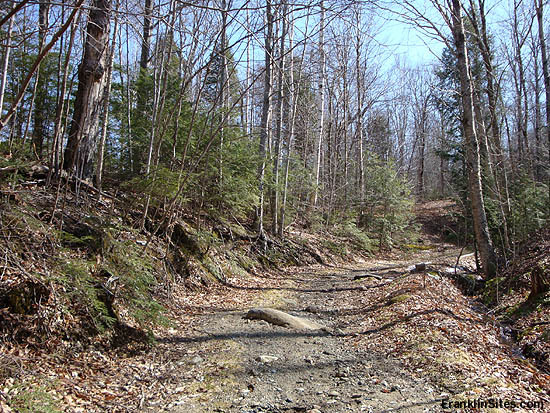 In 2009, the bottom of the hiking trail was rerouted.
" Kinsman Ski Trail. This trail coincides with the Mt. Kinsman Trail for the first 1 1/2 m., as far as the point where the latter turns R. and crosses the stream on a log bridge. 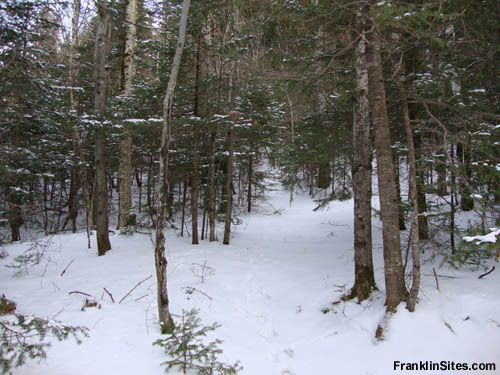 Here the ski trail diverges L. and ascends E. to the Kinsman Ridge Trail, which it meets between the S. and Middle Cannon Balls. It is about 3 m. long, 15 to 40 ft. wide, requires at least 15 inches of snow and is suitable for intermediate skiers. " 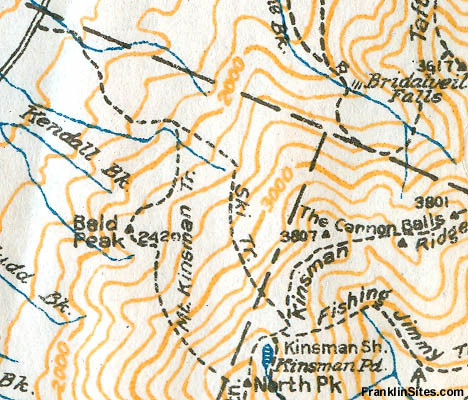 " 1934: AMG Guide provides brief description of Kinsman Ski Trail which runs three miles from Mt. Kinsman Trail to col between S. and Middle Cannon Balls. 1935: Ski guide to Eastern US describes Kinsman Ski Trail as "sporty with many sudden pitches which keep the skier on alert." "
1. Location - S. of Franconia on H. 116. Starts near Kinsman Lodge. Goes E. to Kinsman Ridge. 2. Length - 3 mi. 4. Max. Grade - 5-15º. 5. Vertical Drop - 2700'. 6. Exposure - N.W. 12"-18" snow. 7. A branch trail goes to Bald Knob. Both trails are suitable for intermediate skiers. Extensive open slopes at foot of trail for novices. " 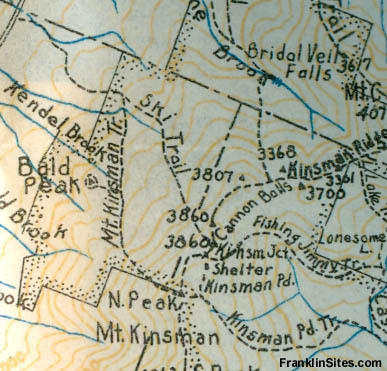 " Kinsman Trail (W.M.N.F.). S. of Franconia on State 116. Starts near Kinsman Lodge. Goes E. to Kinsman Ridge. Length 3 m. Max grades 5º - 15º. A branch trail goes to Bald Knob. Both trails are suitable for intermediate skiers. Extensive open slopes at foot of trail for novices. Public Cabin (W.M.N.F. ), equipped with stove and four bunks, open in 1937 at Kinsman and Kinsman Branch Trails, 1.5 m. from highway. " " Mid 1930s: Kinsman Cabin is built along the Mt. 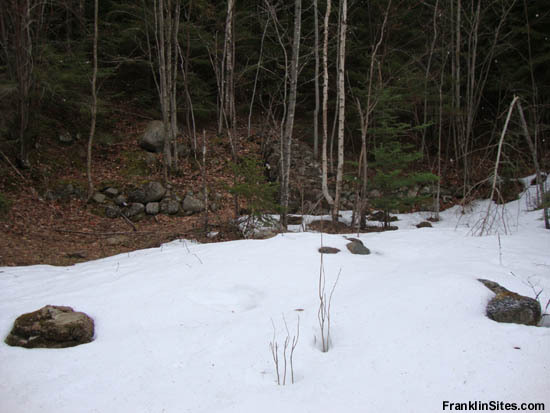 Kinsman Trail to accommodate growing number of skiers frequenting the White Mountains. " " Kinsman Ski Trail. This trail coincides with the Mt. Kinsman Trail for the first 1.85 m. Where the latter turns R and crosses the stream on a log bridge, the ski trail diverges L. At this junction the WMNF has constructed an overnight cabin and first aid cache. Bunks are provided for six occupants. 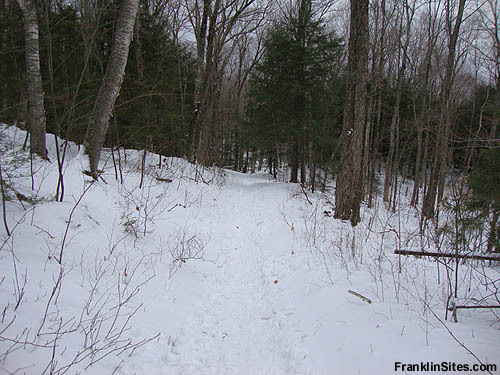 The ski Trail ascends to upper terminus on the Kinsman Ridge Trail, 2.05 m. further. " " 1982: Forest Service decides to remove Kinsman Cabin and rehabilitate site. "